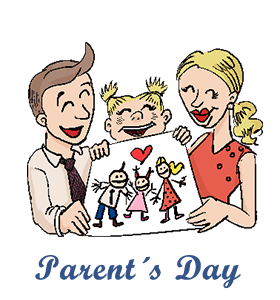 ﻿Parents' Day: Calendar, History, Tweets, Facts, Quotes & Activities. Parents’ Day celebrates and recognizes the important role of responsible parenting in every day family life. Families are a fundamental human institution; they are bonded by unconditional love and commitment. Parents' Day was established in 1994. In a time where society had become increasingly self-centered, President Bill Clinton signed a congressional resolution to commemorate Parents’ Day in an effort to promote family commitment and parental responsibilities. Supported by the Unification Church, Senator Trent Lott introduced the bill into the senate and the National Parents’ Day Coalition was developed to support Parents’ Day by annually selecting ‘Parents’ of the Year’ at local, national and state levels. The Coalition also provides educational programs for parents and aims to promote the stability of family by encouraging fidelity between husbands and wives, as well as abstinence in young people prior to marriage. In addition to The National Parents’ Day Coalition, other organizations use Parents’ Day to promote the traditional two parent nuclear family model. Parents' Day is held annually on the fourth Sunday in July. National Parents’ Day is celebrated at Capitol Hill by annually naming National Parents of the Year. Rev. Keith A. Savage and his wife Bonita were recipients of the 2015 National Parents of the Year Award. In 2015, 3.3 million unmarried or cohabiting couples in America had children under the age of 18. This is in comparison to 1.2 million cohabiting couples with children in 1996. In 1960, 73% of U.S. children lived in a traditional home with two married heterosexual parents in their first marriage. By 1980, this figure had dropped to 61%. By 2013, 46% of children lived in a traditional home. Create a personalized gift for your parents to signify and appreciate their role in your life. Some ideas include an album of family photographs, a poem or an art project to which you and siblings can contribute. Host a barbeque or family get-together. Cook dishes that your parents love and enjoy, or traditional family meals. Join Linkedin's initiative to Bring In Your Parents to your workplace. This will allow them to understand your work and meet your colleagues.